If you have a ScreenSteps Live account that includes desktop licenses then use the following steps to register your software. 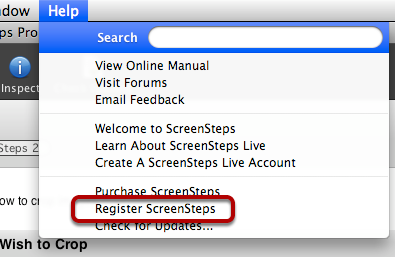 To open the registration dialog select the Help > Register ScreenSteps menu item. Select the ScreenSteps Live tab (1). 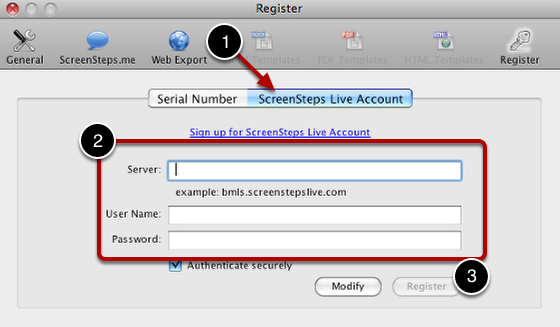 Enter your ScreenSteps account information (2) and then select Register (3). NOTE: Registering your software using a ScreenSteps Live account will automatically create a Web Export account with your ScreenSteps Live information if one does not already exist.